For final two concerts of its 25th season Steyning Music Society is delighted and hugely honoured to bring to Steyning not one but two young artists who are making big names for themselves in the world of music. Martin James Bartlett, piano, fresh from his triumph in the BBC Proms at the Royal Albert Hall will play Bach, Beethoven, Schumann and Samuel Barber. After winning the Young Musician title in 2014 he has performed with top orchestras, at prestigious festivals and renowned concert halls around the world. 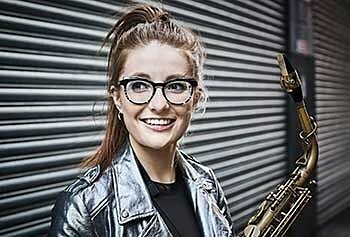 Jess Gillam, saxophone – a multi-talented musician and a very special charismatic performer - was a finalist in the BBC Young Musician 2016. Concert highlights include appearances with the Southbank Sinfonia, Royal Liverpool Philharmonic Orchestra, Manchester Camerata and a guest appearance with Jools Holland and his R&B Orchestra. Her pianist Zeynep Ozcura has worked with conductors Gustavo Dudamel, Sir Simon Rattle and Sir Antonio Pappano and as chamber music has performed throughout the UK, abroad as well as live radio broadcasts in Germany, Spain and on the UK’s BBC3. Her performance is on Sunday 18th November at 15:00. Both concerts will be held at the Steyning Centre, Fletchers Croft, Church St.
TICKETS: members £10 - non-members £15 - students £2. Available in advance from The Steyning Bookshop, Steyning High St. T: 01902 812062. Steyning Music Society T: 01903 812662.